The Dales Way is a long distance footpath of about 80 miles (128 km) situated in the north of England and running from Ilkley to Bowness-on-Windermere. By following as far as possible riverside paths, it offers a scenically attractive route from urban West Yorkshire to the Lake District, which any reasonably fit family can undertake in a week's holiday. Although not always well served by public transport the Way, by following natural and sometimes ancient lines of communication, passes through many villages, and so accommodation is not a problem, although it is advisable to book in advance. The Dales Way Association was established in 1991 to help support, maintain and promote the Dales Way Long Distance path. We are celebrating 50 years of the Dales Way in 2019. * An Ultra Marathon run along the full length of the Dales Way. The race will be run over 36 hours, starting in the Lake District and finishing in Ilkley. It is being organised by Punk Panthers and will feature up to 250 competitors, both runners and fast walkers. The race will start on the morning of Saturday, 17th August 2019. Full details from the Punk Panthers website here. * A Mobile Exhibition of 50 years fo the Dales Way. The exhibition will be on show at the Manor House, Ilkley, in August and tour afterwards. As well as displays on the ROUTE and the HISTORY of the Dales Way, the exhibition will feature stories of the PEOPLE who have walked the Way. We want your stories – your memories, your photos, your tales of wonder or woe. Our archivists, Kath Doyle and Gordon Tasker are working on the exhibition and are ready and waiting to record your contributions. (Contact them at info@dalesway.org or See Gordon’s article in the Autumn Newsletter). * A Re-enactment of the first public Dales Way Walk from Ilkley to Bolton Abbey. This historic event took place on March 23rd in 1969 - with over 120 walkers participating! We'd like to see as many of the original walkers who are still around, as well as others who have walked the trail since then. The walk will be lead once again by Colin Speakman and is planned for Saturday 3rd August 2019. (Read about the First Dales Way Walk here). * A Celebration Lunch at the Craven Arms, Appletreewick. The lunch will be hosted by the Dales Way Associaton on June 20th for a small number of invited guests. 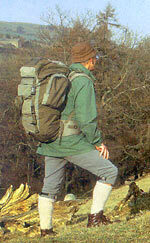 * A History Recording Project to digitize the paper records of the Dales Way Associaton. The year long project will aim to scan all the Committee Minutes and Newsletters produced by the Association since it's formation, and make them available to members via the website as an important historical resource.